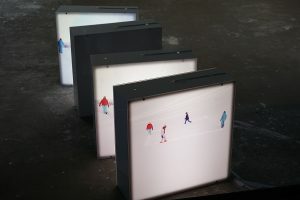 „If I Were A Dancer And I Had A Square“, Kulturfrauenballett, Part 2, a project by Tanja Brandmayr in cooperation with Kunstraum Goethestrasse xtd., 2016. Fotos, videos, dance/praxis, research and performative order. This text was written during the different stages of the project and its subsequent reflection – it refers to the concept of Quasi-Art, especially concerning an extended notion about material and the collective. 8 intellectual movements about the Kulturfrauenballett, Part 2. By Tanja Brandmayr. 1 What is the Kulturfrauenballett? The Kulturfrauenballett consists of women who work in different areas of art and culture – with dance itself being the only exception. We have put together perfomers, cultural journalists, artists, streetworkers, curators. Which means that, with the exception of myself, there is no common personnel in this ballet. In the first part, which was performed in 2013, title and subject even had been: „If I Were A Dancer, Then …“. At that time this subjunctive was taken to the center of the discourse by the establishment of a distinct image for the individual dancer which then had to work within the collective. „If I were“ related to a great playfully-unknown form of possibility. This playfully-unknown form of possibility was, at first, the subject in itself, but also opened up generic questions, like: What form of contemporary dance can I relate to? Which pose would I take? What is it like when I actually have to dance according to my phantasy, when I have to confront the reality of dance and my body in action – in a communion with others who are exposed to something novel as well? 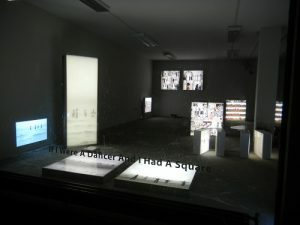 That is probably the larger setting of the Kulturfrauenballett: The dance floor as the exemplary „other“, as a possibility that includes transformation. The dancers of the ballet consist of professional actors within the art context and the culture scene, but not of original dancers, so that there is a pronounced endeavour concerning transformation and coming to something different. The claim is now that this professional expertise translates in a different way, not in a way of a direct expertise, but into something that is strategically open; that transfers onto dance and onto the whole situation and the collective. Since it is about the totality of ballet, the notion of collaboration is also included and integrated. Though it is about a collaboration that is not narrowly and exclusively defined. Working together rather puts a specific plan and a specific product at the center, whereas acting together is not immediately oriented towards a result, but towards transformation, flux and openness. It is not an easy undertaking, and it is about working with contradictions. The most immediate one is that no one of us is a professional dancer, although we claim to be dancers as Kulturfrauenballett, which, however, chooses subjunctives to its titles. That´s what you have again in Part 2 of the Kulturfrauenballett „If I Were A Dancer And I Had A Square“. We aren´t „square“ in this ballet, but we have appropriated some squares. At first we take space/the room – as a base for dancing and choreographical „writing into space“ (which is what choreography actually means). Then, an additional contrast: Whereas in Part 1 foremostly the individual possibilities of the dancer were the subject, Part 2 is also about square surface and collective space: Moving inside the square has underlined the aspect of collectivity – as it is impossible to perform a choreography in a square without being highly alert to and aware of the fellow dancers. We have left out music and in addition to vision breath became an element of awareness. The square signifies a field of the individual as well as of the collective. The subject of the individual and the collective came up in the practice of dance itself, to be transformed between movement and speech. In the end multiple variations of relatively reduced patterns of movements established, that became contectualised with certain places. The appropation of space via the square subsequently led to widened public spaces and into nature. The notion of professionalism is relevant as the Kulturfrauenballett does not consist of professional dancers and, therefore, purposefully works with an adjournment concerning „professionalism“. „Professional“ is, at least sometimes, a recipe for the construction of surfaces. Specifically in the art context the notion of professionalism has to be critically adressed, since stereotypical production is usually not what is desired. On the other hand, many activities in the cultural context encounter strict reglementation, disciplining and (so-called) practical constraints, regardless of professionalism. The Kulturfrauenballett on the one hand affirms professionalism, but also refutes it. Relating to the construction of a framework that poses different questions, or to a setting that should elevate material from beneath surfaces – without translating that material into distinct messages. In itself, the ballet starts as a void, to collect diverse material and then, in an accumulation of methodic approaches, investigate purpose and intention: Since, at the core, the Kulturfrauenballett refers to itself. With all the „immaterial material“ that everyone carries within herself as a frame of reference, experience and knowledge. Hence, our material is also the experience and knowledge of the individuals and the collective. From that, questions can be derived. Or: the questions have already been there but became more immediate alongside the dance movement. In this second part we discussed a lot about the relation between individual and the collective and tried things out how a communication between these entities can become a possibility. What do we want, as individuals as well as a group, within methodological tools and catchphrases – where are our free zones, our individual square on which we can perform our movements? Where is our dancefloor? The square and the dancefloor are to be taken both literally and metaphorically. Each one of us consists of an accumulation of an infinite amount of images, references, influences, people, things, objects, thoughts, etc. I myself have tried to understand myself as a collective at the beginning: Consisting of people and things that are relevant to me; these, say, 10 important things and contexts that carry specific meaning for me. In these ruminations to understand myself as a collective I practically interpreted it by taking books. Of course, it would have also been possible to do this with other entities, with humans, images of animals, a work of art, with something to eat or with a plant, and also with more than just ten things. Yet, in general: Suppose you try to understand yourself as an „inner collective“ in the first place. And with this inner collective you get into contact with other people that radiate their own collectives. Under this assumption it is both complicated and interesting to see oneself as an element within a collective with other people. At this point of my personal considerations concerning ballet and its openness, it became a central point for continuing with such an approach, also concerning the question of materiality. To see not only myself and the participating dancers as dancer-„material“, but to understand them all as their own inner collective and to understand this immateriality as material. An approach that seems appropriate for women working in culture. And it is surely possible to find various other (more contemporary or more ancient) references in art, philosophy, sociology or cultural theory. At any rate, the claim for an extended question concerning materiality: The inside of a person is inhabitated by lots of stuff. And these things get into contact with each other. For instance, inside you there are, besides the already mentioned things, objects, people, thoughts, emotions, also professional contexts that may be drifting apart. That´s what you have in the case of many people, specifically people that work in the context of culture: Many professional as well as private occupations have to be accommodated. Perhaps because of that it has not been too difficult for the participants to add another thing, take an additional thing into account: Ok, now we are also dancers. Let´s see what happens. It was also an experiment in acting together, not working together. That makes the whole thing more open and easygoing. For the practical aspects of dancing collective spaces have been defined concisely – as the squares on the floor. Within these squares of 2×2 meters we then have formulated a choreography and investigated about impulses that bind together the collective momentum at a nonverbal level. The result was a concentrated work, with one to four persons in one square, as a work „with oneself and with the others“ that got executed in various ways within the practice of dancing – in an incredibly beautiful variety and a fascinating mixture of seriousness and lightness, so as that it is a pity that there are no recordings of this practical part. According to an arrangement from the start, so as not to reproduce certain things. The topic of the square has triggered discussion in the group. Related to that the Kulturfrauenballett has established squares in public space subsequently and tried to reassess the claims about the individual and the collective, choreographic planning and personal reflection – without a definite result. This part of execution, respectively of a chosen setting, became documented and a part of the presentation. Of primary importance is motion, that is usually not at the center of activity. This cautious phrasing should indicate that we do not have illusions about ourselves as dancers, but want to allow ourselves to establish jovial sources of friction by referring to contemporary vocabulary and other references to dance. This occupation with movement gets again transformed as it needs to be beautiful and exact. Along with this goes, concerning purely the execution of motion, a certain finding of the context of motion, a notion of a reduced effort of movement. That is one of my favorite approaches, to my mind a highly contemporary one: A tired economy of movement. Create with minimal input an impressive result. In hyperactive times, this is fascinating: tiredness and the idea of performing and executing stuff while being tired. Hence the investigation from where the necessary impetus derives – that becomes clear in such a reduced economy of movement. And upon this, you can erect things. And it allows nonverbal communication about such an impetus. This investigation is carried out by non-professional dancers in a high state of concentration and it is very convincing, by the way. The spectrum of movement is aligned to contemporary dance, but also alongside a loose boundary between the mundane and ordinary and the artificial; how much can you integrate so as that is transgresses mundane movement but deceeds dance. You will notice, it is more than the everyday realm. Yet before it approaches dance, the dancers announce: „No, I am not actually dance“, and then it takes the curve to something else instead. The consequential question is then: but to what? Yet this otherness that is left open is then a void, that eventually HAS to be left open. In general the interest in here is a free and loose one, perhaps because of this the paradoxical reference to ballet. Since to take the concept of ballet serious, with non-professional dancers including me, would be absurd. Instead: to work within limitations but be serious in self-examination. One may say that these are vanishing points within a serious construction that is drifting apart. Me and art, me and the forms of art, me and the others. Me and my tirednes. Me and, etc. About the idea of the collective there has been a lot of discussion, in different group constellations. I think there is no unanimity about it. But we as a group have discussed and investigated collective aspects in theory and in practical terms. One may claim that we have translated ruminations about collectivity into movement and motion. We do not see ourselves as a collective in a common sense. And we do not have to be – since we are a ballet group. And then, we are not a ballet group either. Herein, the notion of performace is probably more helpful, as an experimental, processural, fragmentary and body-related act of the subject. To my knowledge, performance is also denoted as a transformation of the „metaphysical“ into the physical : Screaming, acting out, naked bodies, etc… vs the metaphysical ideas we had before. The images, and the clichés are common: „Otherness“ becomes physically experienceable, which naturally was registered with alienation by contemporaries. The Kulturfrauenballett herein marches to a different drummer, yet has a core interest in the processural and the physical as well. On the other hand it is spledidly ignorant against such a definition of performance as corporeality, and it is somehow classical. Yet „otherness“ and alienation and disconcertment appear again, as I suppose, related to the open question about the purpose of this ballet – and perhaps because of this gesture of taking in something immaterial that is not concisely defined. That does not happen as a proclaimed steering towards a „new form of art“ or a spectacular refutation of „outdated forms of art“ but as a carefully constructed, enigmatically unspectacular paradox in a setting of contrasts: as the pure abstraction of the void that is dancefloor nevertheless, as abstraction of a reintegration, as a metaphor about an empty surface of competence. As the incompetence of a professional dancer needs to be compensated via trying out and professional knowledge. Such a gesture of a reintegration of something unknown, something „other“, is a personal strategy or approximation, that necessarily needs to be done when something should be executed as a ballet, but the ballet is a void itself and professionality cannot be guaranteed as it is not there in the first place. In this respect the subterranean materiality of every actor relates to some kind of hope. Every individual brings things with her about which we do not know how they will eventually materialize and unfold. A very abstract setting, to be sure. Yet also it has brought many practical, sensational and funny experiences – in the hours of practicing, which rather were not about acting our inside out or even a theoretical discourse, but by leaving a huge, and amused question mark above it. Apart from the curious lust about being in motion, we have understood the above-mentioned aspect of tiredness very well. And other aspects have been there as well. That what was exciting and a pleasure also came as exhaling before inhaling again. On the whole it is quite difficult to quote references. It is rather about well-crafted and widely divergent opposites. The is always simultaneous saying of yes and no in this ballet. In a common sense there even was nothing that was directly executed. As we do not want to make classical perfomance of anything and also no visualisation of us as individuals. Instead, it is and it has been all about permanent approximation. Also to the circumstances that we inhabit and that we know well. This visualisation of ourselves as „Kulturfrauen“, for instance… there was a loose reference to Carolee Schneemann at first, who said that, in the 1960s and in contrast to her male colleagues, she knew her female fellow artists, but never had an idea what they were actually doing as artists. Carolee Schneemann said in an interview some years ago, when speaking about a colleague: „I knew her. But I Never Knew, What She Did As An Artist“. There is something bitter in that. We talked about that in a certain phase at the beginning of our Kulturfrauenballett project. I have made a variation of the statement and turned it into a paraphrase that included that desire for communication and recognition on the one hand, but that said „I never knew, what she did as a dancer“. That was an entirely loose association as the Kulturfrauenballett is in no direct way related to Carolee Schneemann. But the paraphrase was important as it added a theme to our group that made the setting even more paradox: Insofar as, in our setting of non-dancers, it would need to say: „I never knew, what I did as a dancer“. And, to be honest, possibly: I do not know, what I do. Not only as a dancer. Perhaps the discussion of this topic included some other emancipatory moments, at least that is the assertion and the hypothesis: That things do transform. Possibly in the above-mentioned sense of this discussion with huge inner accumulations. In the encounter between humans there is that much concerning inner „material“ that one does not know how to talk with each other. Where it starts. One often talks about sustitutional topics of art, about cultural politics or one´s own overwork. Although, within such a context, essential questions arise. Yet we paradoxically started from somewhere else, in a situation where nobody was allowed to feel secure and professional: with the void of the dancefloor. And then people talked about politics and their overwork. But also about other things and references that occured to us during the exercise of practicing. Yet on the whole it has not been that much about self-exposure and self-actualisation. I think because of this the actual visualisation of being a female artist has not been an explicit subject, then. I think no one was really interested about making that explicit in the end. It was rather, in a double sense, about a common motive. Which is to be found at „the inside“, but was also made explicit in a material way: as squares in different places. And there was another thing, corporeal in the literal sense, that we have discovered collectively. And on the whole this entire thing with the dancer brought in a paradoxical moment: Of course we never knew what we had done as dancers, who we had never been. The transformations of levels, the discussions entered the game, many transformations, even the complete sybolism of dance as a metaphor for life could not be avoided – but that can be ok in certain situations as well. And, to refer to the square again: Other references came into play concerning the square… Bruce Nauman or Samuel Beckett. But that´s another story. And Malevich, which would be an addition. As already mentioned, a reference for me was the wild, loose involvment with concepts like the collective, or quasi-objects. I usually like it when divergent opposites are inherent to a project. That cannot be recombined in a sythesis. Probably it is about a new dialectics. As we have different material. I also note the intellectual saturation of this ballet – how this simple acting, as a dancer, inside a square, also in public space, is full of reflections. On the other hand this accumulation is, in every aspect, reality. This individual position of many things and contexts, the references and the whole of bodily, emotional and cognitive references and experiences, that we bring into, and that are embedded in larger systems. Also the element of desire, and of imagination. In the above-mentioned sense of „If I Were A Dancer“, and in the extension: I am, in the first place, my own collective context, we encounter each other in our multi-layeredness, also in the sense of personal accumulation of material that we bring in from the start. And then we do something, collectively. The specific conditions and claims are not even to be answered in the first place … that can be stated and left as a claim and also as an opposition … as a non-rational surface or an accumulation of rationality, irrationality, inner or outer objects that have not been investigated before, or whatever – there are many different materials or contexts. One could also say that we both say yes and no to art, in between all these systems and concepts, and at least we aren ´t dancers but also have become dancers. At any rate we constitute a new collective, that is not designed to swallow the individual but to give space to it. One could also say that the Kulturfrauenballett is a collective that emphasises the individual. At least someone said that. And it surely is not an experience shared by all of us. Is such a thing, loosely defined as it is, art? All of that, the complexity of contradictions that are there in reality, probably can only be caught in a simultaneous „yes“ and „no“. And that makes up a special relation: As we could also say that what we are doing here is both art and it is not. As it is both a ballet and it is not. And how I could understand myself, as the only professional, as the choreographer and the other things I do in there, and then, again, not. At any rate it is about realities and within a framework of concepts of professionalism about the desire of an art that should open free zones. The ballet is a concept of strategic openness, a void. Of course, an ironic reference to history. A procrustean concept often allows, due to the comic undertone, more openness. In any case, the prefix „quasi“ opens a space for fertile nuances. The quasi-dance project, if you want to name it that way, does at any rate not want to be something definitve in a world that is not so definitive and sharply contoured anymore anyway. As far as it does not become brutally simplified, as something that also takes place. It makes non-congruency to its principle. There is a discoursive framework with theoretical references. Apart from being aware of that, and even more about an awareness about intellectual poaching, it is about a serious discours about things that matter. Things that have the potential to freedom, emancipation, theorising and to personal experience. And specifically there is pronounciation of „I am my own collective“ – not because it is about ego and self-exposure, but, on the contrary, that people meet at all levels of knowledge and experience. That, possibly, a different kind of communication at all is allowed to happen, that apart from usual conversation the intellectual, material, substantial accumulations communicate and exchange. The good thing is: Apart from intellectual reflection there was a solid practical part, dancing; and an autonomously transforming execution of the squares – as a counter-movement to these assertions and to everything that is possible. The good thing is that sometimes you intensely intellectuall reflect something, and then it leads to different practical results than expected, which can be investigated and reformulated anew again – making hypotheses in a good sense. And it´s an exciting project that has transformed itself, out of itself, multiple times. Text by Tanja Brandmayr, written from autumn 2015 till summer 2016. Kulturfrauenballett, Teil 2 – A project by Tanja Brandmayr and Kunstraum Goethestrasse xtd. 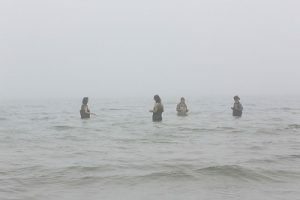 All participants of Kulturfrauenballett, Part 2, Tanzpraxis und Quadrat-Inszenierung: Suna Arslan, Renate Billlensteiner, Susanne Blaimschein, Katharina Brandl, Claudia Czimek, Claudia Dworschak, Sabine Funk, Wiltrud Hackl, Sonja Meller, Beate Rathmayr, Heidemarie Sauer, Getraud Sobotka, Betty Wimmer. Kulturfrauenballett, Part I “If I Were A Dancer, Then …”, Kunstraum Goethestrasse xtd. 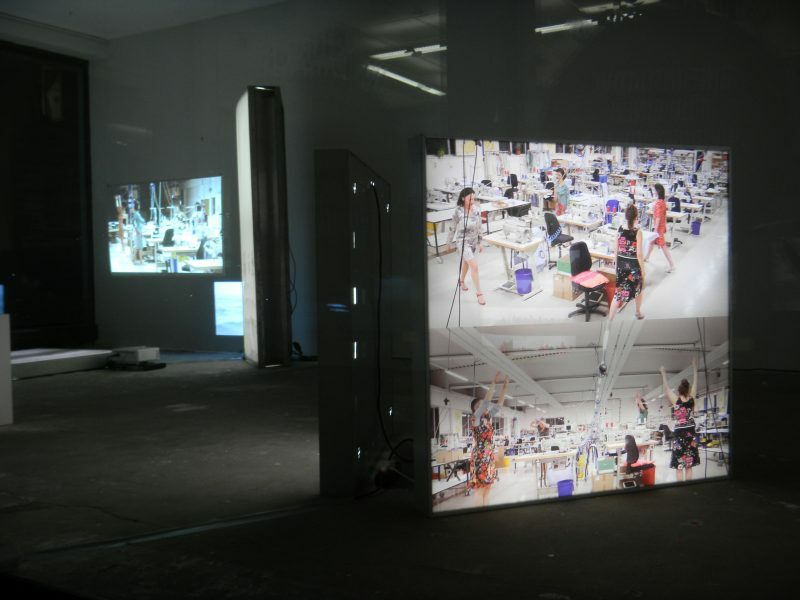 Tanzpraxis, Recherche, Fotos, Video, Installation, 2013.